East Devon is quickly becoming the place-to-be for foodies. The Otter Valley itself hosts The Rusty Pig & Ottery St Mary with all its delicious offerings; Ottery Brewey, Otterton Mill and Otter Valley Ice Cream to mention just a few. Earlier this year a hotel opened just outside Honiton that is set to firmly establish East Devon as a national foodie hotspot – along with MC’s Lympstone development taking shape at the other end, the whole region is blossoming with quality food-stops and destinations. We were invited along to The Pig at Combe to experience for ourselves The Pig Hotel. The hotel is located in the small village of Gittisham just outside of Honiton. If you are coming from Exeter, be prepared to go in to Honiton itself and up through the Heathpark Business Estate and then follow the country lanes along to Gittisham. The entrance with its large gold pig on the sign is the beginning of a long pleasant drive up to the hotel through verdant green fields. The history of this house is extensive. Listed in the Domesday Book, the village and the Combe Estate share connections that stretch back to time immemorial. .
“The village of Gittisham appears (as Gidesham) in the Domesday Book – a survey of England undertaken for William the Conqueror, and completed in 1086. Combe manor was recorded as belonging to the King’s half-brother, Odo, Bishop of Bayeaux. It passed through several families over the next 350 years, by which time a house – probably consisting of no more than one large room, a kitchen and a buttery, with two bedchambers above – had been built. By 1424, the Beaumonts were living in the manor house of Combe. The family held it for almost 200 years. At one stage, during the reign of Henry VII, it passed to an illegitimate son, John Bodrugan. It was his son, Henry, who built the Combe House that we see today. But history aside, The Pig Hotel brand took over the lease in October 2015 (having previously been the Combe House Hotel) – by July 2016 it had been well and truly ‘piggified’ and open for business. Within days it was fully booked. 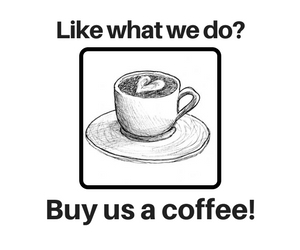 An informal yet quirky interior, married with friendly conversational service. From the minute we walked through the beautiful front door into the bar area, there was a member of staff ready to help. At The Pig at Combe, there is no reception desk; guests walk straight in to a bar area, adorned with walnut wood paneling and comfy sofas, this is where you can wait for your table to become ready, enjoy a drink and warm yourself by the fire. The Pig Hotel has two restaurants, the Devon Restaurant and The Folly which you walk past on the way to the main house from the car park. Before piggification, this had been The Orangery but hadn’t served much function apart from being large and strangely placed. It is semi-restored and sensitively decorated, bringing function and making use of valuable space. The menu here is based around the large wood fired pizza oven. Here pizzas and flatbreads are the order of the day; there are no reservations, just turn up and make yourself comfortable outside or inside. We didn’t eat here, but came and had a nose around after our meal. I had a conversation with one of the chefs (I didn’t catch his name), who gave me the low-down on what sorts of things they serve in The Folly and a bit more about The Pig’s ethos. Throughout our visit, the one thing that came across was the genuine warmth from each member of staff, who were all more than willing to chat. After passing The Folly, guests are lead down a path to the front of the hotel and it is here that we can finally admire the view. It was our turn to walk through the front door to a small welcoming party. We were handed our drinks menu, given a bowl of home-made lemon & seaweed popcorn and made to feel incredibly welcome. 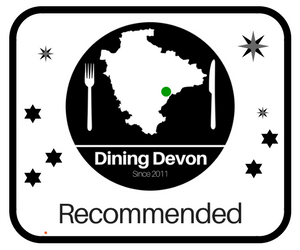 We were going to experience the Devon Restaurant and it’s daily changing menu, sourced from their extensive Kitchen Gardens and select nearby producers. My drink this lunchtime was going to be a bottle of Otter Bright in honour of the fact that we are in the Otter Valley and that Otter Brewery is a matter of minutes away from Combe, I felt the need to honour one of our local brewery success stories. Tori went for the Sherry Puerto Fino which she sipped happily whilst I poked fun at her for being such an old lady in her spirit choices. The bar area is one of the highlights of The Pig at Combe. A long line of genuine classic first/second edition Penguin paperbacks line the mantlepiece above the fireplace, behind the bar sits glass shelves with vintage coloured cocktail glasses that gives this room a cosy unique atmosphere. Whilst sat sipping our drinks, we were handed one of the main menus. This is the 25 Mile Menu with nearly everything on the menu coming from either in the grounds, or from producers within a 25 mile radius. There were some familiar names on the menu including Creedy Carver who produce some exquisitely tasting ducks and Piper’s Farm who we all know and love! The menu changes each day depending on ingredients available. Once our table was ready, we were led in to a large dining room, languishing in light from large windows and adorned with herbs and a spectacular collection of moths and butterfly display cases. We had already ordered our food in the bar area, so all we had to do was sit down and take in our surroundings. Strewn across the dining room, and in fact the whole hotel, pots of herbs and plants that went in to food and drinks served at the hotel; the window sills were forest-like with mint and rosemary, fragrant leaves adding to the interior design elements that would not be out of place in the pages of a style magazine. The menu includes a fantastic vegetarian selection, but also a section called Piggy Bits – aperitif style dishes created as a warm-up act before the headliner. I went for Ham Hock Eggs made with quail eggs from The Pig’s very own flock of quails, Tori and her secret love of pork scratchings made her go for Pork Crackling & Apple Sauce – both (£3.75). Perfect aperitifs to the main show! The Hock Eggs, small and perfectly formed with a seasoned ham encapsulated in breadcrumbs and garnished with herbs and a tangy drizzle. Had we been given three large plates of Hock Eggs I would have been happy! The crackling was served in long strips with apple sauce to dip, perfectly seasoned and crispy in the right places! As we waited briefly for our courses to arrive we couldn’t help look around the room; a group of ladies lunching, couples on holiday, chatting away over glasses of wine enjoying the natural light coming through the large windows which had been covered up until the recent piggification. For starters I went for the “A Pinch of Salt” Cured Meats (£8) and Tori decided on a Courgette and Walnut Soup (£6) from the ‘Literally Picked This Morning’ section of this already inspiring menu – which, as you might have guessed, was produced with courgettes from the kitchen garden. The Cured Meats, served on a wooden platter with a home-made chutney was garnished in greens from the kitchen garden and green olives. The whole dish was well thought-out and put together, the meats were not overly greasy as smoked meats can be and worked really well with the chutney. Tori enjoyed her soup that came with freshly baked bread and a toasted nut garnish across the top. For main course I went for the Creedy Carver Duck Breast served with Roasted Carrots, Chard & Rowan Berry Sauce (£19) with a Flower Pot of Triple Cooked Chips (£3.75) and Tori plumped for the Trimlett Fam Pork Collar (£16) with a side of Buttered New Potatoes (£3.75). For me texture of meat is as important as taste. A tasty steak is let down if I have to chew it 100 times before swallowing. The duck breast was cooked to perfection, silky and soft as it bathed in a light gravy; it had a richness that balanced with the accompanying vegetables really well. And yes. I had chips with it, but what chips. Freshly cooked and clearly made out of potato, and not an indiscriminate mash, these were perfect chips. Tori’s pork collar was tender and as expected, perfectly cooked with a sumptuous helping of buttered new potatoes, these went down very well from the other side of the table. We finished off the meal outside with teas and coffee, kids played happily on the large lawn outside whilst couples relaxed in the wooden loungers overlooking the wonderful view. After relaxing outside for a bit we decided to go for a wander around the house. The piggification of Combe House has been sympathetic to many original features, and given it is a Grade 1 listed house there is only so much one can do. The interiors promote cosiness and a place to come and enjoy should the weather change, or just somewhere to snuggle up on a cold night. After bumping in to the wonderful Robin Rea (hi Robin!) Chef-Proprietor of The Rusty Pig in Ottery St Mary, we strolled up the hill behind the main hotel to explore the vast Kitchen Gardens that the kitchen use to supply their daily changing menu. The Pig at Combe showcases some of the best we have to offer in Devon. Set in beautiful surroundings amongst verdantly green fields on Gittisham Hill overlooking rolling hills off towards Exeter. Using home grown ingredients; some of the best local producers within a small radius and presented in a modern relaxed atmosphere. The menu changes daily depending on season and availability of ingredients, you’ll need more than one visit to properly take in this location and appreciate some of the fine foods that are being served within its walls. Gourmet Burger Kitchen (GBK) is celebrating the opening of its new Exeter restaurant with a big burger giveaway.